I don’t know about you but in winter I tend to use hand cream every day as the cold weather really affects skin on my hands. It’s weird, but the most dryness occurs on my fingertips which I really dislike so I regularly moisturise in order to improve the condition and to prevent things from getting worse. 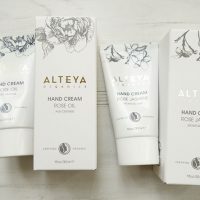 Over the past few years I managed to get my hands on quite a few natural and organic hand creams as I really wanted to find ‘the one’. 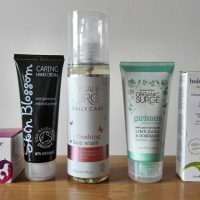 So I discovered some really good natural hand creams which I will be sharing with you in this post. I currently own quite a few hand creams (pictured above!) and that’s because I bought a couple from TK Maxx at a reduced price and I got one for free in a magazine. Rose Geranium hand cream from Skin Blossom is 98.85% natural and made with 87% organic ingredients. It’s suitable for vegans and certified organic by The Soil Association. It’s free from ingredients like parabens, phylates, phenoxyethanol, glycols, synthetic colours and fragrance. It gets absorbed easily leaving hands moisturised and protected without greasiness. It’s surprisingly affordable hand cream considering it’s certified organic. Get it on Only Naturals for £5.99. This Balance Me hand cream feels thicker and richer than some other natural hand creams that I’ve managed to try. It doesn’t absorb that quickly and feels slightly sticky but this feeling disappears after a while. For this reason, I prefer using it as an overnight treatment or at times when I know I won’t be using my hands that much. It’s 98.8% natural and contains no parabens, mineral oils, silicones, glycols, artificial fragrances and colours. It’s more suited for very dry hands than the hands which just needs a bit of maintenance. It came free as a part of Marie Claire magazine but you can get it on Look Fantastic with free delivery here. Now, Skin Food from Weleda is not a hand cream as such – it’s more known as a multi-purpose balm-like cream. It’s great for any dry area on your body and this includes extremely dry hands. It’s quite thick and not so easy to spread but you can make it thinner by adding a few drops of body or facial oil. Weleda Skin Food makes a great overnight treatment and it does wonders on those hard working hands. I recommend it to those who suffer from extreme dryness and even cracks as it’s really nourishing and deeply hydrating. You will see Weleda Skin Food stocked on various websites such as LoveLula and LookFantastic. You can also find it on Amazon. Organic Surge hand cream is a natural hand cream I’ve been finding myself reaching for more often than for any other hand cream currently in my collection. I love how quick it is to absorb – it’s one of those hand creams you keep in your drawer at work and use when needed. It’s non-greasy but still moisturising and protecting. It contains Peruvian Inca Inchi Oil which is rich in omega 3 – this just helps to protect your hands a little bit more. It’s 99% natural and made with 78% organic ingredients (it carries EcoCert logo). What’s more, it’s suitable for vegetarians and vegans. I love this hand cream and I will be definitely repurchasing in the future. Get it on LoveLula here. Bee Lovely Hand cream from Neal’s Yard Remedies is another hand cream which I tried and is certified organic by The Soil Association. I totally love the orange fragrance which is supposed to lift the spirits. In terms of scent, this is my favourite natural hand cream. I’ve been using it mostly at work as it’s non-greasy so you can just get on with your work after you have applied it. You need to be careful not to apply too much as it may not absorb that quickly then. By buying this hand cream you will help raise money for projects that help to save our precious bees. Get it directly from Neal’s Yard Remedies website (£10 for 50ml). Last year I tried another hand cream from Neal’s Yard Remedies – Geranium and Orange. See full review here. I’ve reviewed Botanicals Lemongrass & Mandarin Hand Balm previously here and although it’s not really classed as a hand cream I still wanted to include it in this post. I really love the scent of this hand balm – it’s lemony, with a hint of mandarin. If you want 100% natural, this is it, Botanicals hand balm couldn’t be more natural. It’s also certified organic by the Soil Association and made with 89% organic ingredients. I must warn you though, Botanicals hand balm is not easily absorbed and it’s more suitable for night use than the daytime use. But when you wake up with lovely soft hands in the morning it makes it all worth it. You don’t need to apply much for one application so this should last you for a while. Get in on LoveLula for £14.50. 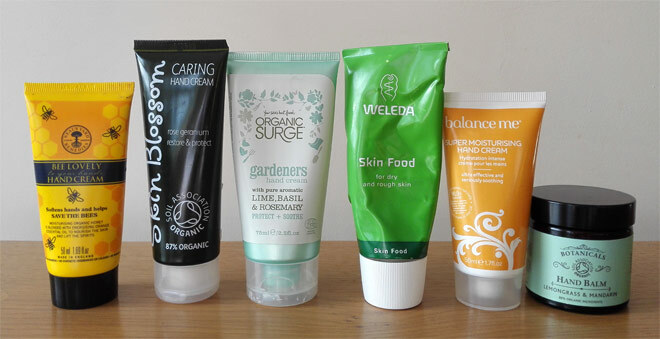 I loved organic hand cream from Rather Lovely which I tested earlier this year. Its delicate lavender scent was perfect for my bedtime routine when all I needed was relax. The hand cream has a light texture but it’s really nourishing, yet non-greasy. It’s made with ingredients certified organic by the Soil Association but the product itself is not certified organic. Read a full review here. Have you tried any of these natural and organic hand creams before? What is your favourite natural hand cream at the moment? I have to admit I often forget to cream when I really should!!! I love your list of creams, the very first one the rose skin blossom sounds amazing and I love the fact that its almost 99%natural and 80% organic!! It’s a lovely cream and I am happy to recommend it. I also use cream in winter season but I feel that my hand is looking so poor due to moisture. So that I was so upset. I consulted with my friends but they had no idea. I have used so many creams but there is no any benefit. Can you tell me please is there any infection from your cream? I can’t use such cream. What kind of creams have you been using? Are they natural? It’s important for the creams to be as natural as possible as otherwise some creams may cause irritation and not even help at all. The hand creams that I tried didn’t give me any irritation at all. I have so dry hand. So, is this cream perfect for me? I don’t know which cream would suit you best, the best is to try different ones until you find the one which is right for you.